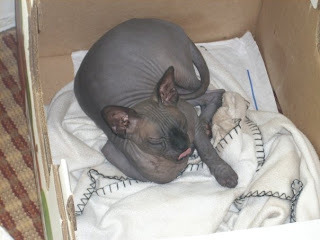 Smoky is awesome and yes, he looks a little bit rat like, but that is part of his charm. I am just glad that you came out ahead on the 'Who to keep, Smoky or Mommy?' vote...Beckham and I voted for you, but Carter went with Smoky. Dang girl, you are funny...stinkin funny. Not like Hallmark card funny but like Christmas present Pilates DVD abs sore funny. I told Maggie my New Years Resolution is to drink MORE Diet Coke. She just looked at me. Your loss was definately our gain. We are lucky to have Smoky sleep over here. Although who would think a cat would have to take baths. That's just weird! Too funny Brodi. 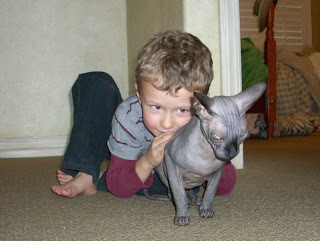 And you must love your kids a lot to try a hairless cat. I think I ma allergic to the way he looks. Eek. 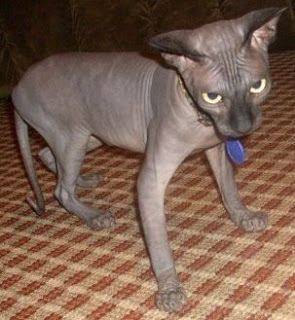 he is the ugliest d@mn cat i have EVER seen! i am just a shallow person! LOL! As far as the your revision status goes, just be glad Ted didn't tell you that you had to cut 2 words for every 1 you added! It was like, "I need you to add 5,000 words of content, but it also needs to be 5,000 words shorter than it is now." Actually, all in all, it ended up being 9,000 words shorter than it originally started. And why am I telling you this? Because it is the only way to make myself feel better after seeing the size of Smokey's friends list.